Theory : Stereogram Images, Games, Video and Software. All Free! A Stereogram is an optical illusion of depth created from a flat, two-dimensional image or images (wikipedia.org). Our website is dedicated mostly to Single Image Stereograms, also known as Autostereograms. We'll be calling them just Stereograms. A Single Image Stereogram is a two dimensional image with a hidden illusion of depth, which could be observed (seen, revealed) by viewing them in a special way. A stereogram usually consists of repetitive patterns or objects. When you diverge (look through) or cross (look in front of) your eyes, the patterns or objects overlap, and that develops the hidden depth. A Parallel Stereogram requires you to diverge your eyes or to look through the image, in order to see hidden depth. The hidden image will appear behind the picture you are looking through. Crosseyed Stereogram requires you to converge your eyes or to look in front of the image, in order to see hidden depth. The hidden image will appear in front of the picture you are looking through. Parallel stereograms are more common then cross-eyed ones, and they both have pros and cons. Some people say that cross-eyed stereograms are difficult to view and they cause more eyestrain. On the other hand parallel stereograms have a limitation on pattern width (parallax) which makes it difficult to design large parallel posters. If a cross-eyed stereogram is looked at with the parallel method and visa versa, a parallel stereogram is looked at with the cross-eyed method, they both will have inversed depth, the hidden image will be inside-out. There is no official terminology for all stereogram types, so that there is no official classification by type either. This is an approximate classification. 1. Hidden Image Stereograms stereograms with hidden objects which are not obvious until the stereogram is revealed. 1.1. Random Dot Stereogram (RDS, SIRDS) hidden depth is encoded by random dots. 1.2. Patterned Stereogram hidden depth is encoded by a pattern, which could be any picture or drawing. 1.3. Mapped Texture Stereogram (MTS) hidden depth is encoded by a texture, which is also used for texturing the hidden objects. 1.4. Contour Stereogram hidden depth is encoded by contours of hidden objects. 1.5. Stained Glass Stereogram painted Contour Stereogram. 2. Object Array Stereograms repetitive objects become three dimensional or appear on different levels of depth. 2.1. 2D Floaters (Wallpaper) flat objects appear on different levels of depth. 2.2. 3D Floaters flat objects become three dimensional and could be on different levels of depth as well. 2.3. Solid Array repetitive and seamless pattern becomes three dimensional. 2.4. Cloud Stereogram set of small objects (clouds) form a hidden object. 3. Text Stereogram (ASCII) a text document which works like a stereogram. 3.1. Hidden Text Stereogram hidden image is formed from a text pattern. 3.2. Text Array Stereogram repetitive words appear on different levels of depth. 3.3. Pop-up Text Stereogram some letters pop up and form text or sentence you can read. All the types could be combined in one stereogram to achieve various effects such as transparency, layers of depth, 3D ornaments, etc. 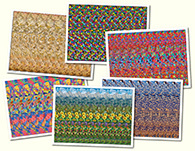 Most common are Patterned Stereograms, 2D/3D Floaters and their combinations. 1. Thank you for this site. It is really cool. I made a program that made stereograms using C++. It was for a class project in computer graphics class. Its inputs were a depthmap and an initial pattern. br I ve always wanted to see a cartoon made out of stereograms. It would take a lot of effort but I d love to see it. 3. why would you let that person post that crap. I ask because this seems like a real cool site?! 4. someone should delete the first and second comment. br br i think it would be great if there was one example of each stereogram or at least of those where you have an example so it s easier to understand the difference. then people can submit the missing ones. 6. Thanks for the site. 8. This is a very nice site.It has helped me to get back into stereograms and the free builder is great.Anyone into stereograms should also check out Gene Levine\ s work at colorstereo.com.In my opinion he is the King of stereograms and a true artist.Have a great day. 10. Congratulations! 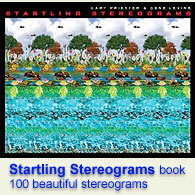 The section about stereogram\\\ s videos is very nice!... Do you know about \\\ Pulfrich Effect\\\ ? I think it is possible to use this method for help the correct visualization: For example one point could travel in straight line (from right to left). The viewer need one lens in front to right eye and he will believe that the point is moving over a surface behind the screen. 11. Roberto of course we know about the Pulfrich Effect there are 3D commercial videos using it. 12. ¡ Thamk You for the answer!... I refered to use Stereograms Thecniques anf Pulfrich Effect SIMULTANEOUSLY . For example 1) An star field cross the screen between the surface from right to left 2) the viewer see the scene with the dark filter in one eye and 3) the vision of the viewer automatically will be oriented in the correct direction (behind the screen). 4) Finally the image will be focuse and ¡ Ualá ! the hidden image in 3D ¡ Thank you so much and congratulations! 13. ¡ Thank you for the answer!... I refered to use Stereograms Techniques and Pulfrich Effect simultaneously. For example: 1) An star field or a chain of text cross the screen over the surface of the stereogram from right to left 2) The viewer see the scene with the dark filter in the right eye 3) the vision of the viewer will be oriented behind the screen (in parallel stereograms) 4) The image will be focuse and 5) ¡ Vualá ! The hidden image appear in 3-D... (Please erase the old version of this comment. It had many mistakes). 15. Nice idea for hidden code! 17. 333love it. how does one do a painting in sterogram? 18. Love it. How would one do a painting in stereogram ???? 19. Love it. How would one do a painting in stereogram ???? 20. Love it. How would one do a painting in stereogram ???? 21. 333love it. how does one do a painting in sterogram? 26. The hidden code itself is really great idea. Thank you! 33. Per vedere facilmente gli stereogrammi paralleli poggiare un dito sull angolo esterno di ciascun occhio e tirare leggermente verso dietro per farli divergere.